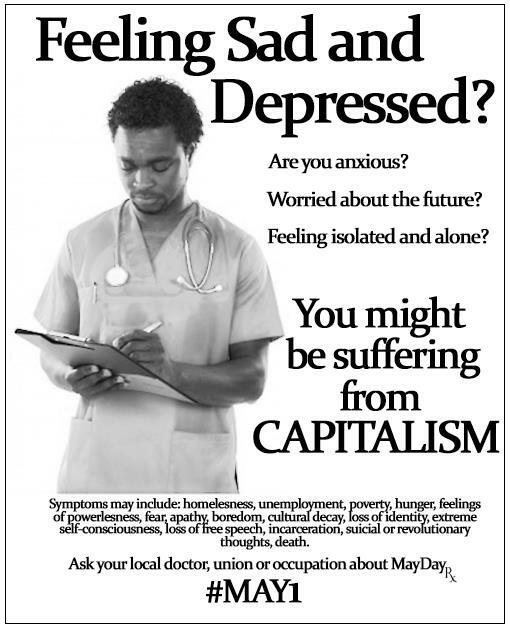 WE CARRY ON WITH JOB DE-CENTRE, CALIBAN AND THE WITCH READING, MUTUAL HEALING IN NEW CROSS, BUT WE DON’T POST THIS HERE ANY LONGER, CHECK THE FIELD CALENDAR FOR UPDATES. This entry was posted in Uncategorized on November 6, 2016 by newxcommoners. Lewisham council is planning to develop their empty Besson Street site. They will make the decision to go ahead with their profit-making, gentrifying project while many people are still unaware of it. A group of campaigners based at The Field will be going around the neighbourhood to ask what people really think of the plans. Come and join us in being Lewisham’s Consultation Team (Militant Wing). We’ll meet at The Field on Saturday 24th of July at 2pm. This entry was posted in Uncategorized on June 17, 2016 by newxcommoners. Come and join us on a Listening Walk of the local Deptford area. We will spend some time thinking through a few sites in and around Deptford that we want to listen to: What does community sound like? What does gentrification sound like? What does culture sound like? What does how we live sound like? Maybe we can answer a few of these questions as all go together in an exercise in listening to where we live. We will start at Tidemill working together on a route around the local Deptford area and collectively decide on the sites we should listen too. Then we will walk together in silence around all the chosen sites. On returning to Tidemill we will ask ourselves ‘What did we hear?’ and make a record of our answers. A Listening Walk, is being led by Chris Jones of 56a Infoshop & Ultra-red. The sound art collective Ultra-red studies, develops, and tests procedures for collective listening that contribute directly to political struggles. We invite communities to listen to the acoustics of contested spaces, their own and others’ demands and desires, the echoes of historical memories of struggle, and their own self-organizing activities. ON LISTENING TOGETHER: WHAT DID YOU HEAR? A few years ago, rather than asking people simply to listen to what we had made, we began asking, “What did you hear?” The modesty of this query belies the labor of shifting the foundation of Ultra-red’s practice from the terms of music (e.g. aesthetic evaluation and the organization of sound) to those of listening—the relationship between intention and perception. This shift was necessitated in part by the still unsettled correlation between our aesthetic and political interests and orientations. Rather than ending with representation, we begin with representation. Then, “What did you hear?” The question enters the object into a relationship, an interrogation. When the representation is about to close in on itself, we restate the question or displace one object with another. As a second consequence of asking “What did you hear?” we situate our sound practice in relation to specific constituencies, locations, conditions and concerns. Most importantly, we organize listening as a collective rather than as an individual procedure—listening as a relation to an other. Finally, and perhaps most difficult to discuss, is the tense of the question: “What did you hear?” There is an acoustic action, the attention that bends to it, and then the question, “What did you hear?” What we heard was our encounter with the object. Our responses to the question teach us, in part, the terms of that encounter. The articulation of these terms provides the foundation for a political analysis. Thus, rather than only paying attention to what the sound represents, to what it indicates or means, collective organizing benefits from a rigorous understanding of how we tender our attention, of how we listen. We will be reading Hannah Arendt’s The Human Condition with LA activist and writer Fred Dewey. Fred has organised several readings of this book, often alongside the organisation of the neighbourhood council movement in LA. The first Saturday we will read section 4 to 7 of chapter II looking at ‘the private and public’. We will define what we read as we go along, discuss ideas to develop, and work through our differences. 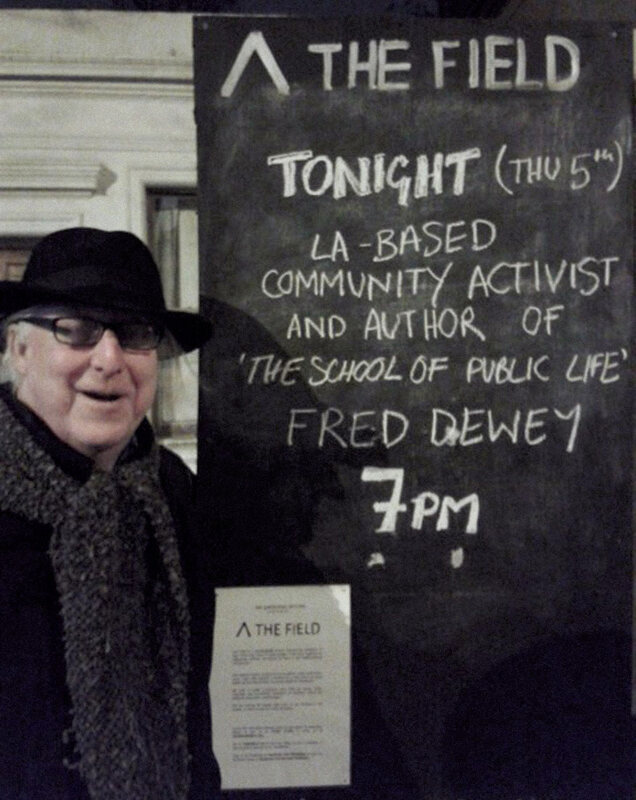 Last year Fred presented at The Field his book The School of Public Life (http://www.errantbodies.org/doormats_4.html), triggering an inspiring discussion (summarized in the “toolbox” page of the new cross commoners website). This reading is also a continuation of that discussion. This entry was posted in Uncategorized on May 5, 2016 by newxcommoners. 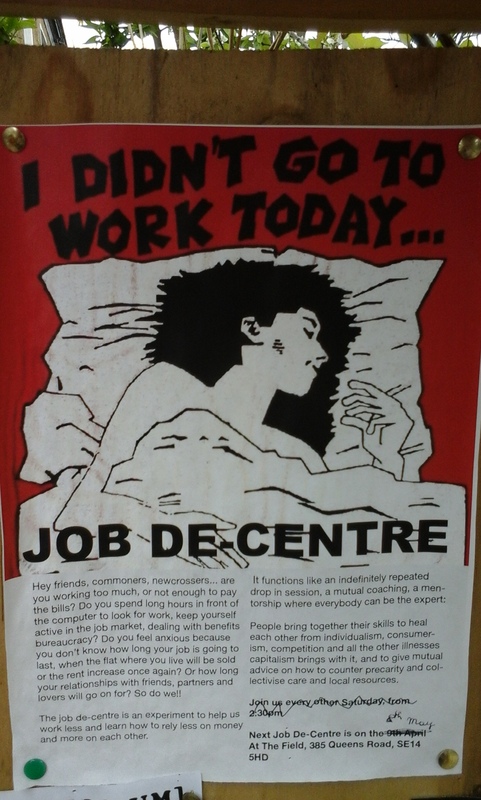 The next job de-centre will be on Sunday the 8th of May from 3 to 6 at The Field. 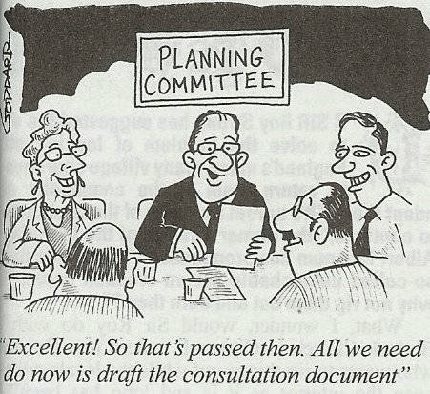 As usual, people will propose activities and we’ll decide together what to do (or not to do). 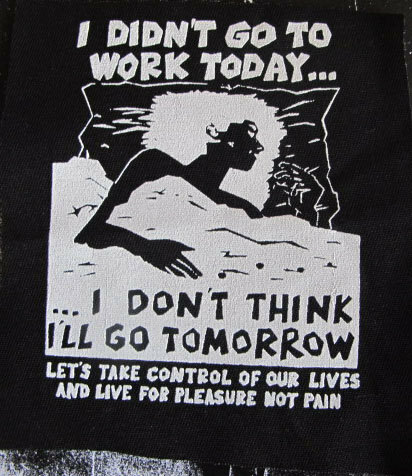 The attempt is always to think and talk in unusual ways about work, unemployment, precarity, how to live with less money and with each others’ help. And hopefully it will be not simply thinking and talking. Cliff and Alex will propose an activity on “how we consume data and how data consumes us (e.g. giving people their data back in the form of tea blends)”. To find out more you’ll have to make it! This entry was posted in Uncategorized on April 28, 2016 by newxcommoners.